Google has released an iPhone version of Google Translate. Google Translate is a web service that translates text between languages using computer algorithms and while its accuracy has room for improvement, it is generally accurate enough to get simple points across when no other resources are available. 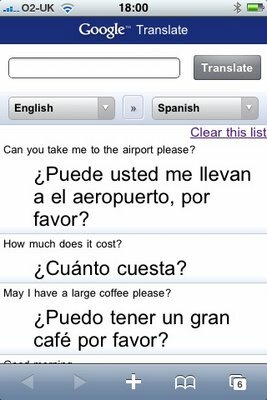 Google Translate for iPhone is optimized for speed, supports all of the existing Google Translate language pairs, and uses a client-side data-store on your iPhone to hang on to your past translations so you always have them at hand, even if you can't use the local data network. We wrote this using the AJAX Language API, so every time the Google Translate team updates the languages they support, the languages will automatically be added here.